After hearing the CTU strike was nearing a resolution, I was surprised to hear that it was, in fact, going to continue for two more days. I was more surprised, though, at the rationale behind that decision. “This union is a democratic institution, which values the opportunity for all members to make decisions together. The officers of this union follow the lead of our members,” President Lewis said. Have you ever heard of such a thing? She's going to walk the picket line with her members, tell them what's going on, hear what they think, and make a decision based on that. The officers follow the lead of the members. That is leadership. That is democracy. We have a very, very limited notion of what democracy is in this country. It's not, in fact, choosing between Tweedledum and Tweedledumber. Democracy is when we are part of the discussion, when decisions rise from the people. Democracy is not when you get to choose between two people, neither of whom you'd have chosen as a last resort. Furthermore, democracy is not when you don't even get to do that. 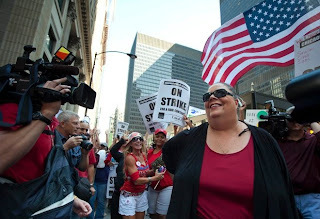 Karen Lewis knows what democracy is. She knows who she represents. She is a beacon in a very dark time. I am so impressed by her.